An elegant heron skulks deftly amongst the reeds in search of fish, whilst hawker dragonflies whirr zigzaggedly over lily-pad waters. The summer afternoon is abuzz with the sounds of nectar-hungry hoverflies and bees, and the effervescent chirrup of reed warblers and reed buntings. Elsewhere families are lazily lolling in buttercup meadows, children chase butterflies, whilst a couple try and keep their neverstop dog from catching a squirrel, all within sight of their homes. 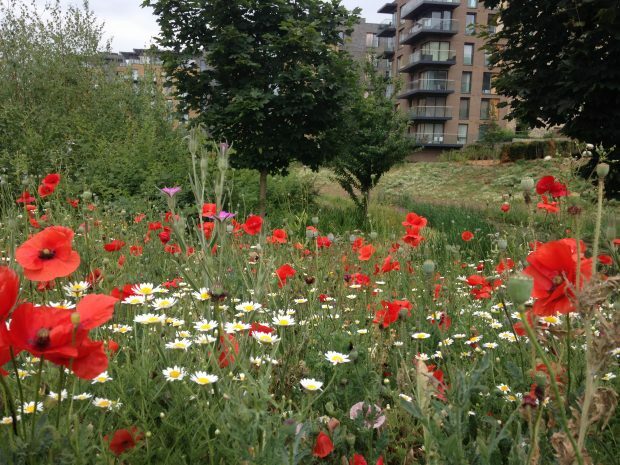 This is Kidbrooke Village in 2022, a place where wildlife is part and parcel of a new urban neighbourhood. Kidbrooke Village is being developed by Berkeley Homes on the site of the late – and notorious - Ferrier Estate, and lies on the catchment of the delightfully named River Quaggy just south of the A2 in south-east London. New landscaping improvements designed by London Wildlife Trust, in partnership with Berkeley Homes, represent a positive step in delivering nature conservation gain here. Over 4,800 new homes will be built at the Village over the next twenty years, along with Cator Park - 20 hectares of parkland creating a multi-functional green corridor linking Sutcliffe Park to the south with the nature reserves at Kidbrooke Green and the Trust’s Birdbrook in the north. To ensure a biodiversity net gain, the new landscaping was implemented in 2018 (following a consented scheme), including species-rich meadows and wetland with benefits for wildlife and local residents alike. 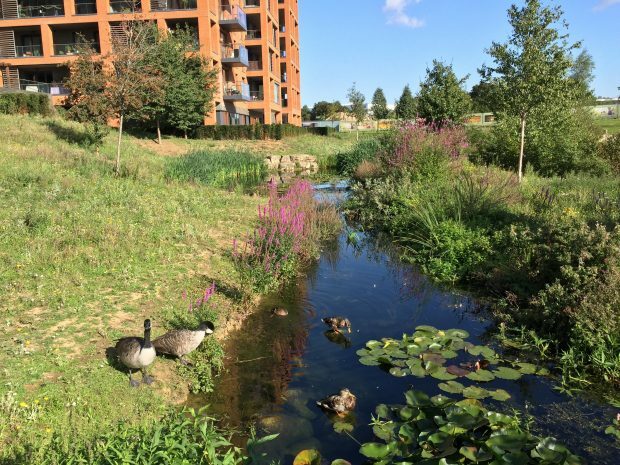 London Wildlife Trust has been developing its approaches to biodiversity net gain following on from delivering Woodberry Wetlands (in which Berkeley Homes has been a supportive partner) and learning valuable lessons from our earlier off-setting pilot projects with Network Rail. 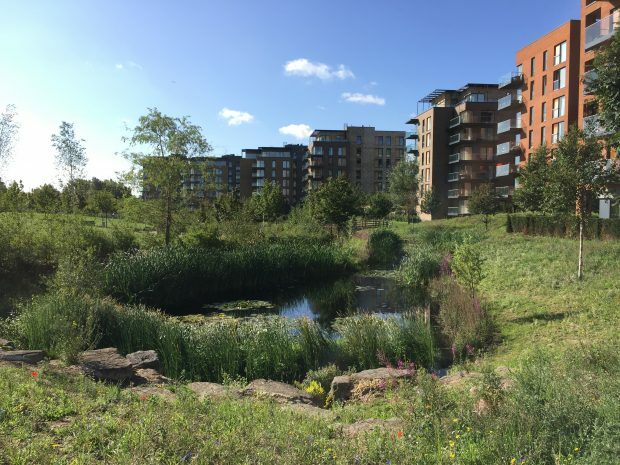 Kidbrooke Village is one of several projects we are working on with the Berkeley Group to help ensure biodiversity net gain is met on all their future development sites, a business commitment they made in 2016. Our partnership is based on a growing understanding of the bigger role biodiversity has in creating healthy, vibrant neighbourhoods for future generations. Designing and implementing biodiversity net gain goes hand in hand with delivering a climate-change resilient development and in London will typically include habitat creation, diverse naturalistic planting, biodiverse sustainable urban drainage systems and green roofs, and wildlife features such as swift bricks and bee hotels. Whilst it may be many years before red kites return to the skies over Kidbrooke (from the Old English cyta brocca ‘the brook over which the kites fly’), the net gains the Trust is helping to deliver here and at other regeneration schemes help to demonstrate the potential for securing richly biodiverse neighbourhoods in London, with all the additional benefits they provide for people. Defra’s current consultation on making Biodiversity Net Gain a mandatory requirement in the planning system is a significant step towards achieving this aim. This is positive but needs careful consideration of how it will be delivered in practice, if we are to secure tangible and sustained gains for wildlife in an increasingly crowded city. Please have your say before the closing date on the 10 February.